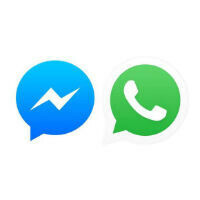 Facebook Messenger and WhatsApp are huge. That's probably not exactly news though. WhatsApp notably has more than one billion active users while Facebook Messenger has crossed the 900 million active user plateau (though there's likely quite a lot of overlap in those user bases). Now, Facebook has announced how many messages the services process, and the number is rightly huge. At the annual F8 developers conference yesterday, Mark Zuckerberg said that activity on Facebook Messenger and WhatsApp combined is now at 60 billion messages a day. For comparison, all of the SMS messages sent globally is just 20 billion per day. Although, it's unclear how accurate that SMS statistic is, because that's the same figure that made the rounds in January 2015 when WhatsApp announced it was processing 30 billion messages per day. While it's possible that SMS usage hasn't grown since then, it seems unlikely. However, that also leads to a question about the Messenger plus WhatsApp stat. WhatsApp has added more than 300 million active users since announcing that it processed 30 billion messages per day by itself and Facebook Messenger has added more than 200 million users since last year's F8 conference (again, there's probably overlap in those numbers). So, either Messenger doesn't add much to the message total, or the activity levels of those "active users" is flattening out. Why would it not add up? Whatsapp users started making calls (it was introduced a year ago), which decreased the volume of messages. I don't wanna be Facebook's advocate.. Just wanted to point that out. Another thing is Messenger took away some of What's app popularity. So let's say you're a Whatsapp active user. Last year you had 10 people to constantly chat with. This year you message 6 of them constantly. The other 4 you message on Messenger. You are still an active user of both apps, but your usage slowed on one at the expense of the other. I've definitely moved some of my SMS communications to WhatsApp. So, I wouldn't be surprised to see SMS shrinking. I killed my Facebook account 3 years ago, so Facebook apps are a nonfactor to me. Whatsapp has become my favorite cross-platform messaging app. Hope video call option is available soon. I used to be talk/hangouts user for long time but video call quality was bad...not sure how it is since p2p connection support. 95% of the messages are some form of LOL.